OK, America, you've had your breather, and now it's time for the 2016 shenanigans to begin. 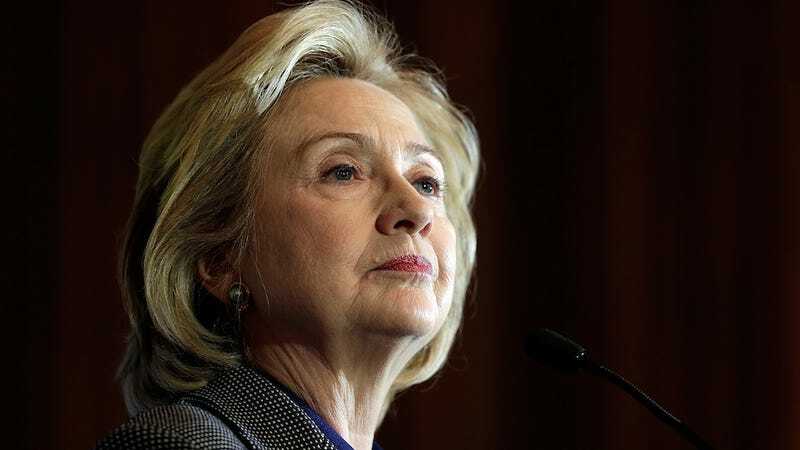 For instance: Our old pals at Citizens United are already working on another "documentary" about Hillary Clinton—a sequel, if you will, to Hillary: The Movie. Don't everybody pre-order your tickets all at once! "What's it going to be called?" I inquired. "'Hillary: The Benghazi Years'? Or 'Hillary: Benghazi, Benghazi, Benghazi, Benghazi'?" "Oh, she's not going to get off so easy," one of Bossie's colleagues interjected, meaning that the film would not be limited to the right-wing Benghazi narrative. Bossie explained: "It will be all of the State Department years." Can't wait to see how they handle Texts from Hillary—presumably she sacrificed a kitten under a full moon to make herself into a meme. Despite prompting a controversial Supreme Court ruling, Hillary: The Movie had basically zilch impact on the 2008 race. But it might be tougher to escape Bossie's handiwork next time. He told the Hollywood Reporter when the project was first announced that, "Now that I won that case, I can do whatever I want with this new movie. I can advertise it on radio and TV, show it on TV whenever I want to — all the things they stopped us from doing with Hillary: The Movie." Maybe they'll do us all a favor and spin this SNL skit into a full movie starring Kate McKinnon.